Ole Glory Classic Slot Guide & Review - Casino Answers! 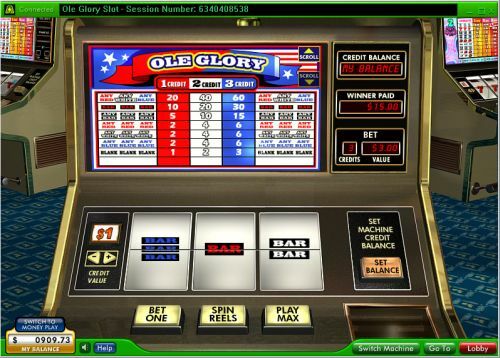 Ole Glory is a 3-reel, 1-line classic slot machine developed by Random Logic. You can play the Ole Glory classic slot machine at Bovada. Bets on the Ole Glory slot machine are $0.05, $0.25, $0.50, $1 and $2. You can bet 1-3 coins. The lowest you can bet on the Ole Glory slot machine is a nickel per spin up to the maximum total bet of $6 per spin. Ole Glory is great for casual slots players. To play Ole Glory, select your bet with the “Bet One” button and hit the “Spin Reels” button. To play the 3-coin maximum bet, hit the “Play Max” button. To win the 10,000 coin top jackpot on the Ole Glory classic slot game, you must hit a Red 7 symbol, a White 7 symbol and a Blue 7 symbol on the payline. This is winning combination is identical to that of the Sevens & Stripes Classic Slot. The second highest winning combination is 3 Red Sevens. If you hit 3 Red Sevens on the payline in Ole Glory, you will win 5000 coins. You can win lots of cash if you hit these jackpots when playing the Ole Glory online slot at Bovada. There are 15 winning combinations on the Ole Glory classic slot machine. The complete payout schedule is as follows (1/2/3 coin payouts in parenthesis): 3 Blanks (1/2/3), 3 of any Blue symbols (2/4/6), 3 of any White symbols (2/4/6), 3 of any Red symbols (2/4/6), 3 of any Bar symbols (5/10/15), 3 Red Bar symbols (10/20/30), 1 Red/1 White/1 Blue symbols (20/40/60), 3 White Bar symbols (25/50/75), 3 Blue Bar symbols (40/80/120), Red/White/Blue Bar symbols (50/100/150), any 3 Seven symbols (80/160/240), 3 Blue Seven symbols (150/300/450), 3 White Seven symbols (200/400/600), 3 Red Seven symbols (1199/2400/5000) and Red/White/Blue Seven symbols (2400/4800/10,000). Ole Glory not only offers two big top payouts, but a lot of small payouts as well, making it great for big wins as well as small wins. You can play the Ole Glory slot machine for real money when you sign up and make a deposit at Bovada. Can players from the United States of America play the Ole Glory slot machine for real money? Strangely enough, American players cannot play the Ole Glory slot game for real money at Random Logic casinos. For a very similar slot machine that is actually USA-friendly, we recommend you play the Sevens & Stripes Classic Slot at Bovada. How much can I win on the Old Glory classic slot machine? If you play the $6 maximum bet and you hit the top jackpot on Ole Glory, you can win $20,000!